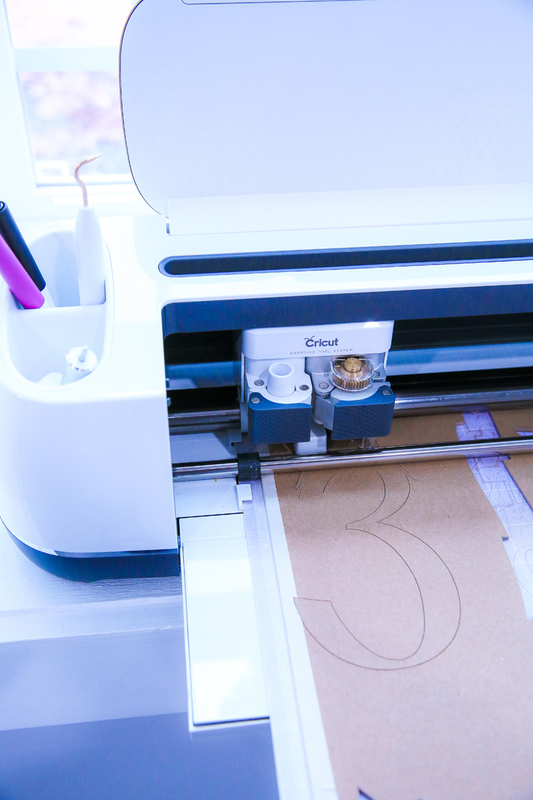 Let’s make a Frozen Cake Topper with the Cricut Maker! 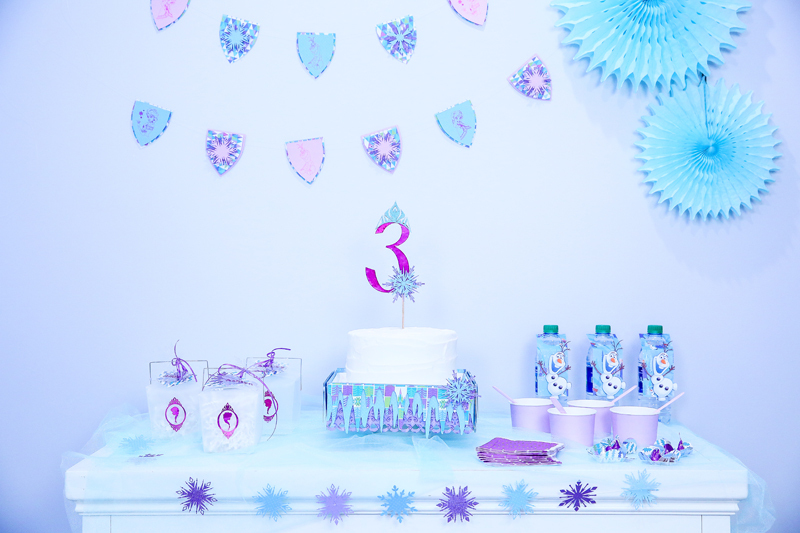 Do you have a little one with a birthday and a love for Disney’s Anna and Elsa?! If you do, this is the perfect Frozen cake topper for you! 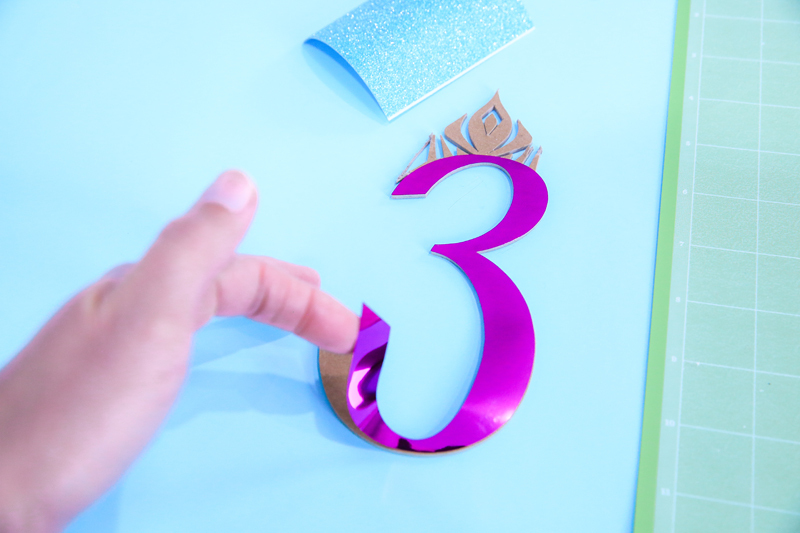 I’ll show you how to use your child’s age, and weld a crown to the top, to make a darling personalized Elsa and Anna cake topper. 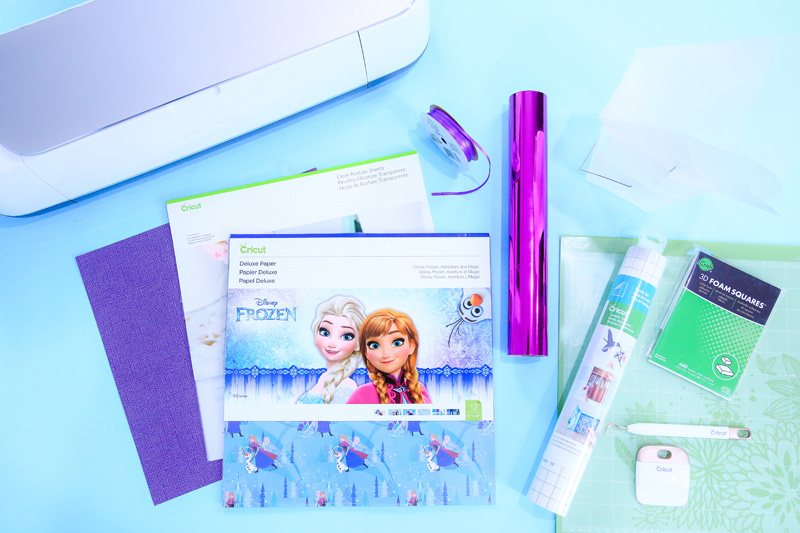 Embellish it with glitter and foil, and Disney’s new Frozen Adventure and Magic Deluxe Paper set for the perfect decoration! Why stop there, I’ll show you how to embellish your cake plate too so that even the most basic white cakes steal the show! Instructions are for an 8” cake on a 10” cake plate. Open my Design Space project. 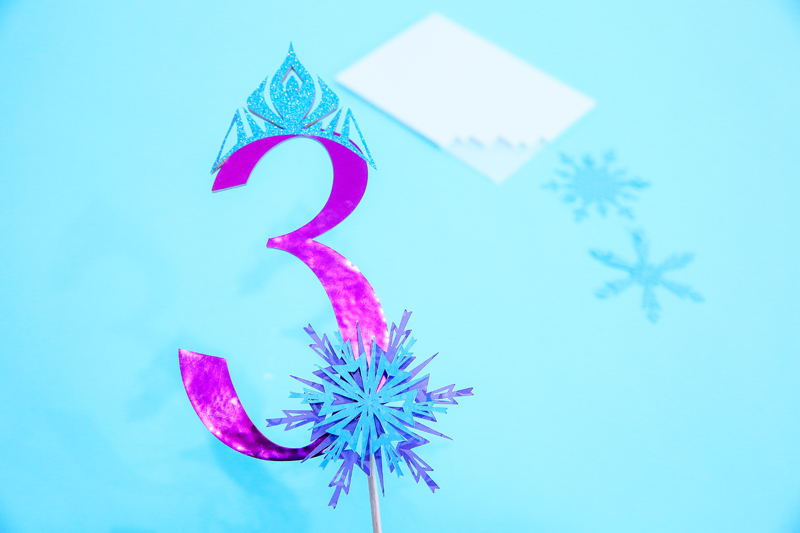 For the cake topper, if your child is turning three, you’re all set. If not, I used the font "Banco Com Heavy" for the number. Once you have the number, duplicate it. 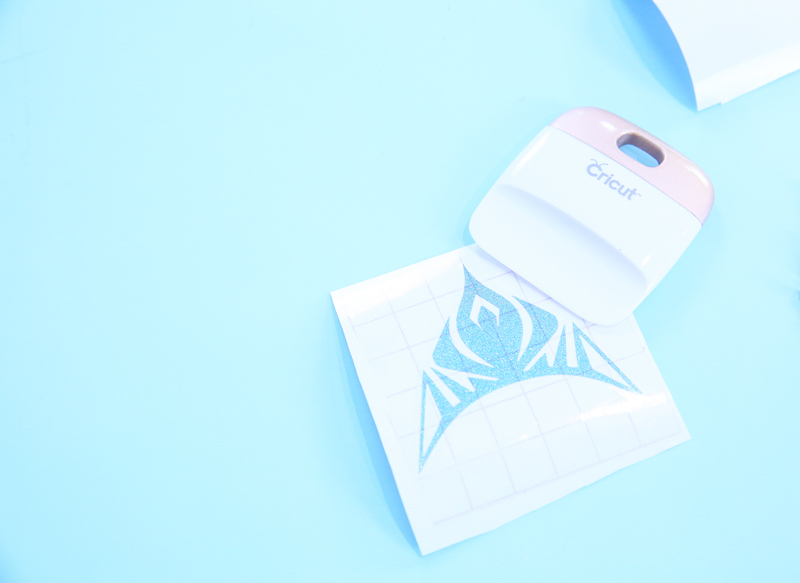 This will be the adhesive foil number. Use the other number and duplicate the Elsa crown. Place the crown on the new number, and weld. This will turn the group black/dark gray. 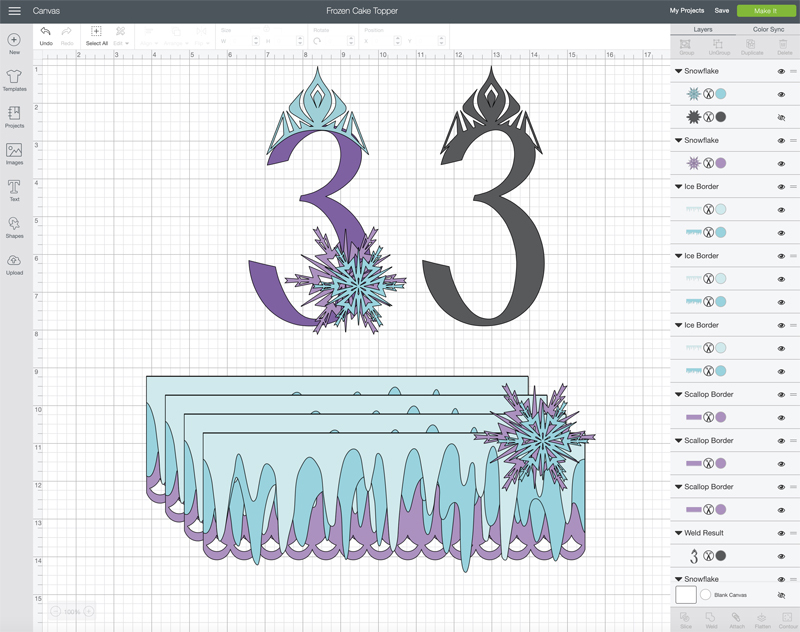 Now you’ll have a silhouette of a number and crown, and a separate number and crown. For the cake wrapper, if your cake plate is 10”, then you’re all set no matter if it’s square or round. 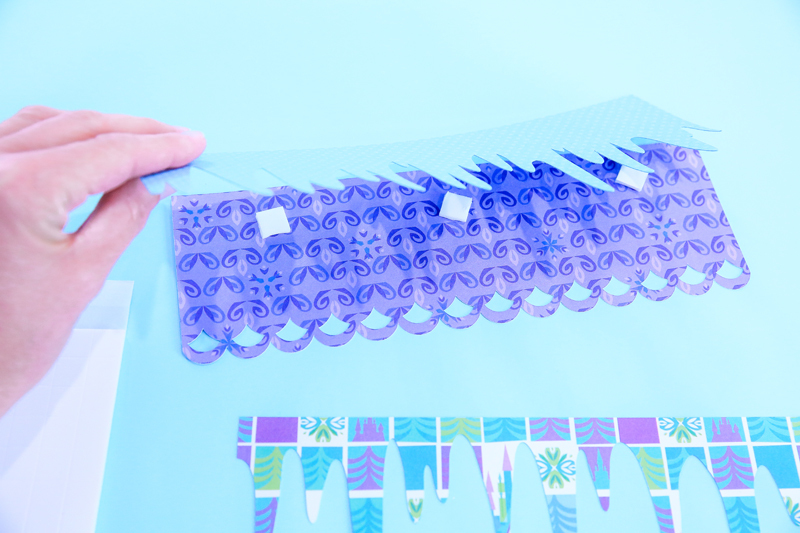 If you have a different size, duplicate one scallop section, resize to what you think you need, duplicate so you have four pieces and do a test cut with plain paper. Once you know it fits the way you’d like, delete three pieces, duplicate the other top two ice layers and size to fit the scallop piece you tested. Delete all the original cake wrapper pieces for the 8” cake. Cut out each of the elements. I used Chipboard for the base number crown combo, adhesive foil for the number, glitter vinyl for the crown, Disney’s Frozen Adventure and Magic Deluxe Paper set for the snowflake and cake wrapper. Using Chipboard and the Knife Blade, cut out the number and crown combo. The crown is fragile. If the edges fray, don’t worry. Just trim away with scissors. The glitter vinyl will cover up any imperfections. Once Chipboard is cut, layer foil on three, and glitter on the crown. Layer two snowflakes with foam adhesive dots for the bottom of the number. Glue dot or hot glue a wooden dowel to the back. Your cake topper is done! The cake plate wrapper is cut from a combination of Disney’s Frozen Adventure & Magic Deluxe Paper and a Light Blue Cardstock. Layer starting with scallop and foam adhesive squares. 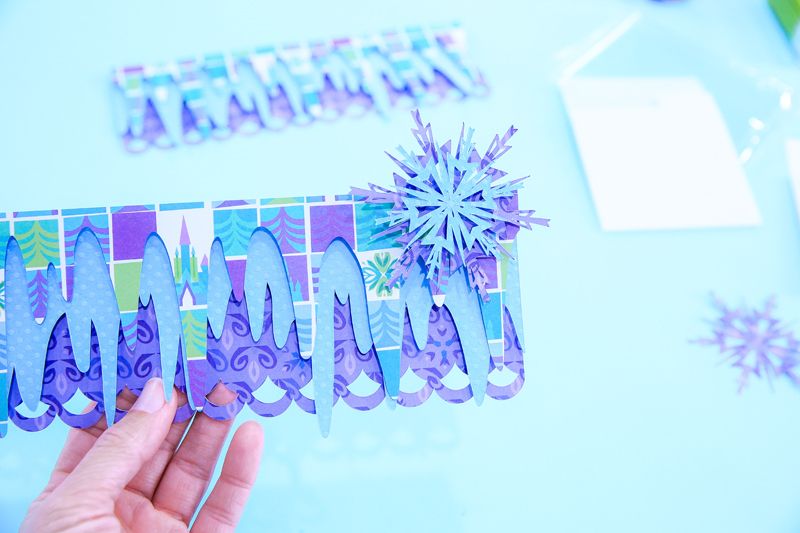 Embellish front of cake wrapper with layered snowflakes. I use glue dots to attach the wrapper to my cake plates. They clean away easily with no damage. It will start to fall off after a few hours but can easily be put back in place if the party is still going! As always, I hope you’re inspired to create! And if you’d like to see more of my Cricut creations, join me at The Celebration Shoppe (https://thecelebrationshoppe.com). Step Into 2019 and Be a Fearless Creator!